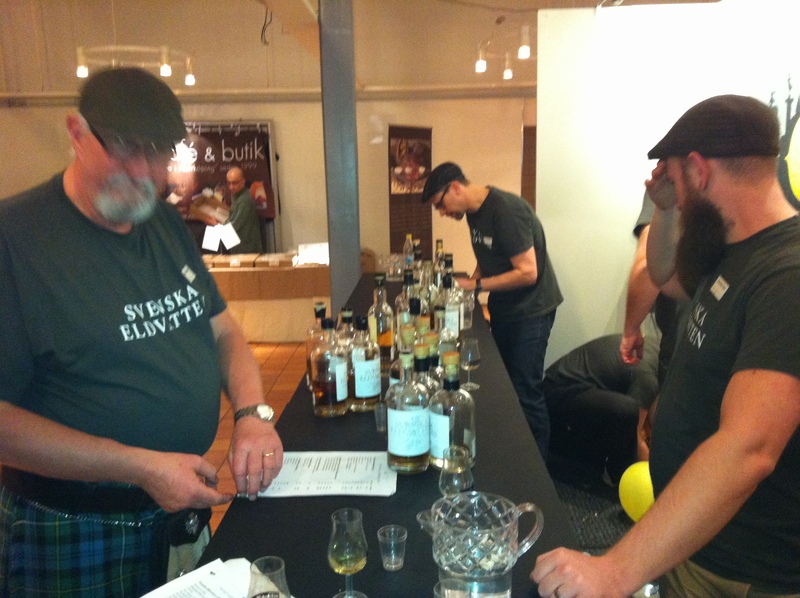 Whiskyfairs in Sweden has popped up like mushrooms the last few years. Beside the biggest one – Stockholm Beer and WhiskyFestival – we have the big but maybe a bit more manageable Malmö Beer and Whiskyfestival, Gothenburg Whiskyfair and Linköping WhiskyExpo. There are also lots of small and medium fairs which are cosy and more intimate. We had not planned to go to Linköping WhiskyExpo which is one of the most reputational fairs, but sad circumstances sent us up north and with only 2 hours drive we thought a visit to the fair was a good send off for a friend we will meet again on the other side! For us it was balm for the soul. We acted quite cool I must say since it was a secret we would show up. So we sneaked up behind the stand of Svenska Eldvatten where Tommy and Peter had a helping hand from Patrik, Bengt, Tommy from Calner Whisky and Alexander from AZ Spirits. Lots of hugs and a taste of Svenska Eldvattens Vintage 1994 singel cask blended malt and Vintage 1979 singel cask blended scotch! They are blended at birth. It means that rawspirit from different distilleries (malt and malt & grain in the 1979) has been blended together and matured in the cask togheter all the time insted of blending the already matured whisky just before bottling. They are both SherryCask´s and my first opinion is that it was a bit too much sherry in 1979 and the 1994 felt more fresh. A second try is needed! Picture taken at closingtime just before Mr & Mrs Wolfmoon was politely but firmly told to get out of the building! Meeting some frien ds was just what we needed so when we went into the worldwhisky Section it was fun to meet Lennart and Ingela at the Nikka stand. And with their knowledge they got us some lovely Single Cask Yoichi, Miyagikyo 15 and a Taketsuru 21. The Taketsuru 21 is a great blended malt but I must say that the single cask Yoichi and if you can get your hand on the Single Cask Miyagikyo are fantastic! 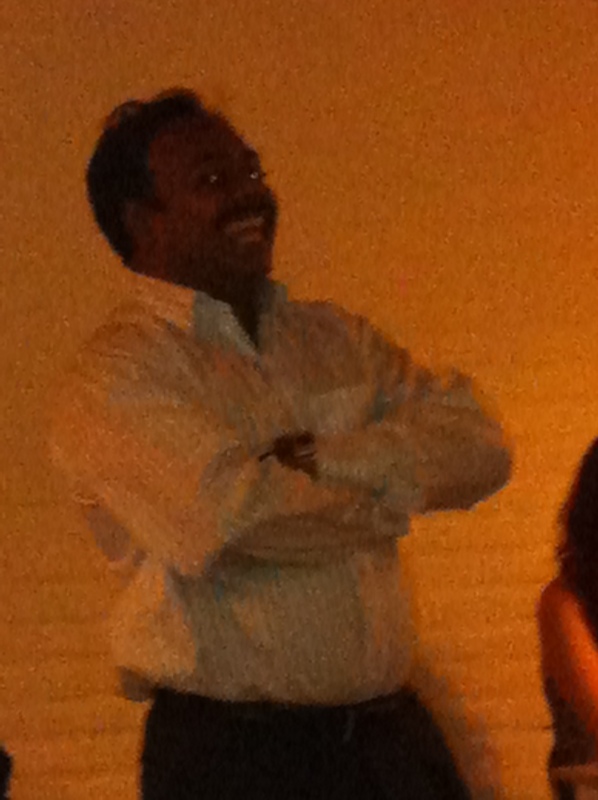 Picture taken at the Amrut tasting at Maltstock – the relaxed whisky weekend! Amrut is sold in Sweden by Clydesdale. And Clydesdale has a affliated company called World Wide Brands managed by Stefan Jansson. We met him and his lovely wife Gun. They are both passionate and knowledgeable people. Among other brands they import bottles from the independent bottler Samaroli from Italy and Millstone from Zuidam distillers in The Netherlands. Millstone is close to our heart since we have a share in sherry cask from Millstone. 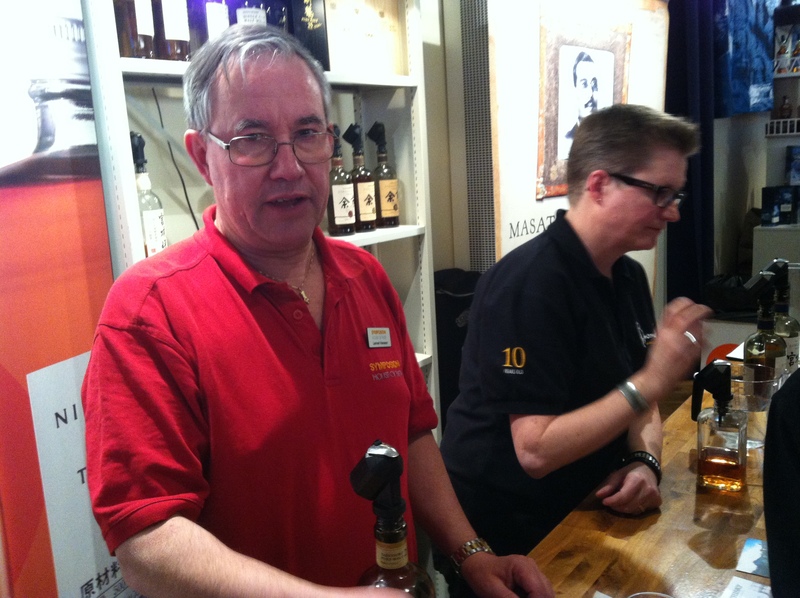 We got to taste a Millstone Px cask bottled just the day before by Patrick van Zuidam who was at the fair. It was….interesting!!! Not the nicest Millstone we tried but interesting is better than plain isn´t it?? Except from talking to Stefan and Gun the biggest experience was to taste the 20 yo Glen Grant from Samaroli. We got the dram poured int our porto-glass but then we got another glass to try it in. We were told to puor half the dram into the strange glass and then smell the whisky. 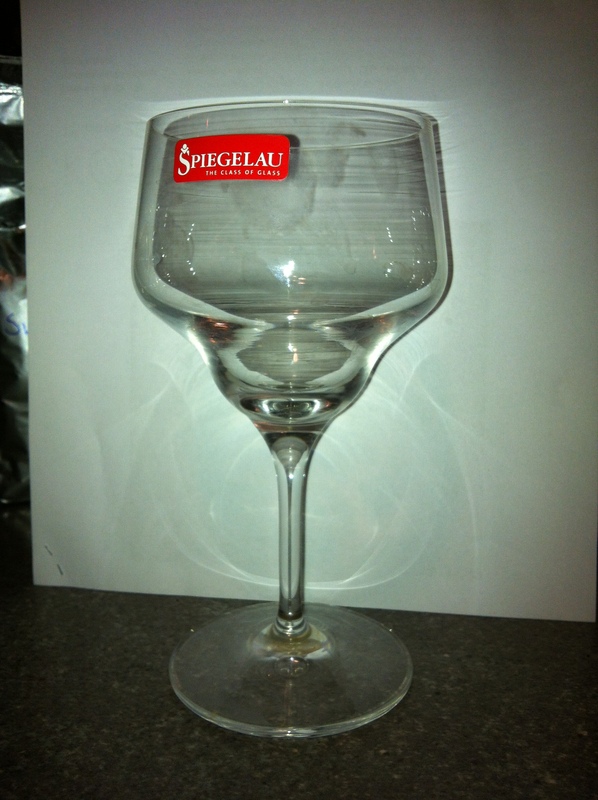 I have always said that porto is the best nosing glass for whisky but this glass… this coupe glass was fantastic. I say I need at least 12 of them so we – mr Wolfmoon and myself – can have a tasting with 6 different whiskys in those glasses! Try and buy! Not on the market in sweden yet but soon I hope! No danger though! 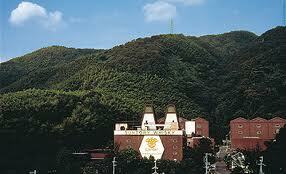 Tatsuya is a nice guy but he didn´t have any Sherrycasks or Mizunara cask with him. So we tried the Hakushu 18 instead. And it´s not Yamzaki 18 …….. But nice! After that we had to hurry up a bit! We jogged into the swedish section where we wan ted to surprise my friend Mattias from Sirholmen Spirits but he had heard the rumours and sneaked up on us instead. 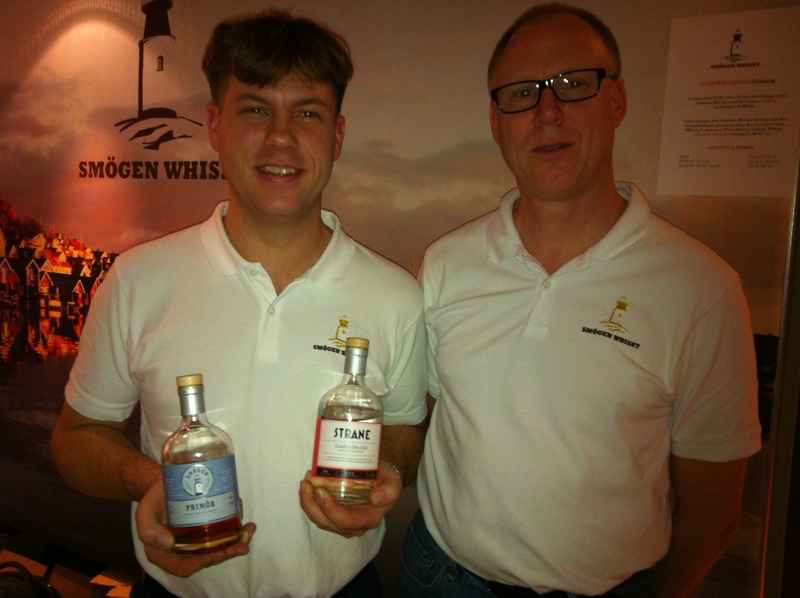 He was working with Pär Caldenby from Smögen Whisky and I was excited to meet Pär for the first time and equally excited to try his 3 year old Singlemalt Primör. 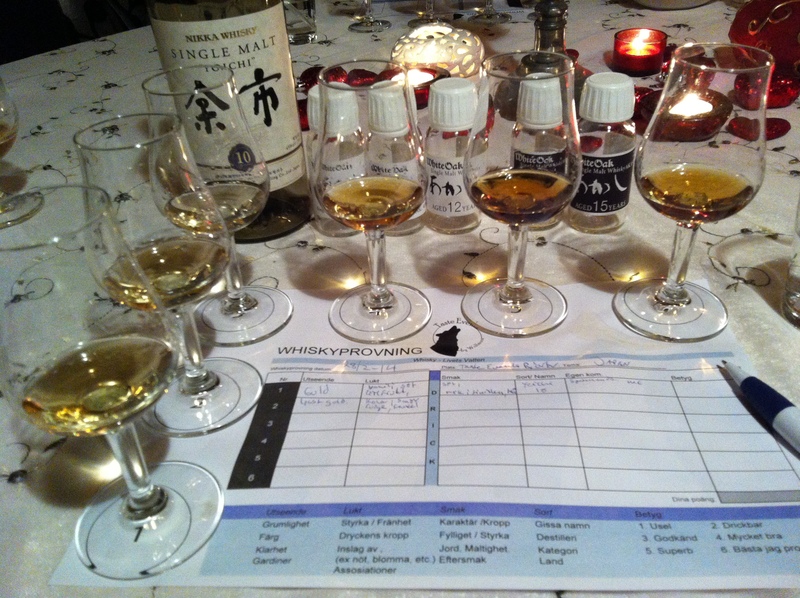 And my tastenote for Primör was a bit simplified – it tastes whisky! By that I mean it taste like original whisky. I try to find the tastenotes and stop at malty with some fuseloil and that it feels round bodied. For me it needs a few more years in the cask. I will follow it´s progress with interest. But then Mattias and Pär knocked my hat off with something different – Gin.I don´t like Gin. Well, I do now…… (another world to explore). 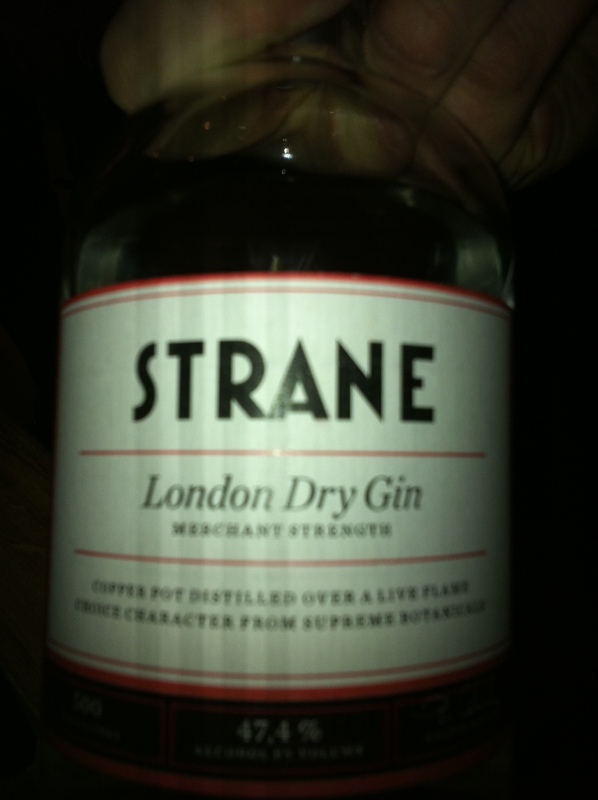 Strane is a smoth and well tasting Gin that I wish everyone who is interested in destillates should try. Amazing! Thank you for inviting me to the world of Gin! The last Whisky we tried was a Mackmyra Elegant Sherry Reserve Cask – a favourite when the cask does what it should. But we wanted to try it against the Box Distillerys non peated sherry. But since its only a pre-taste of what is going to be, the competition isn`t fair. We thought that Box would be equally good since we adore the Box Rawspirit and our private peated casks is soo coming on. BUT the Mackmyra took the gold medal this night with Box actually a horselenght after. Strange!!!!! Will keep an eye on this progress as well. And I might buy a cask of Elegant Sherry from Mackmyra – want to join?? We finished the Expo with some 25 yr old rye and two Rum from Svenska Elvatten. Caroni and Guyana. But don´t ask about tastenotes……. we got half thrown out after that. But just because it was closing time …we werent ´drunk, rude or anything…I hope …………..
Just to mention we tried some grain from Scott´s selection (nope…didn´t do the trick tonight…) and som bottlings from Cadenhead. Our own choices wasn´t so good but Magnus from Magnus Whisky told us to try the 24 yrs old small batch Cragganmore…….and Yes! Soo good! Whiskytaste Sweden has some interesting bottlings as well. Jonas and Gabriella made us feel very welcome and we could have been standing there all night. It was good they had a tasting to host so we could see more of the fair. We were treated a 25 yrs old Tamdhu, a bottling from Whiskyfässle provided more citrus than any other dram I´ve tasted. Paul John is another interesting Indian whisky and Whiskytaste Sweden give us the opportunity to taste Leviathan II that holds the bronze medal in Worlds Worst Whisky. That is interesting. I don´t find it as bad as my male companions……. Lots of leather and …well other stuff. Have tasted worse and since there is a silver and a gold medal as well, that might be true!!! Next fair to visit is the floating Cinderella Whisky Fair in march – but before that Mrs.Wolfmoon shall be hosting some tastings! Taste Events by Wolfmoon is actually getting some work done!